Chicken is a great go-to meat to whip up for dinner, but the same recipe served over and over can get tired, fast. 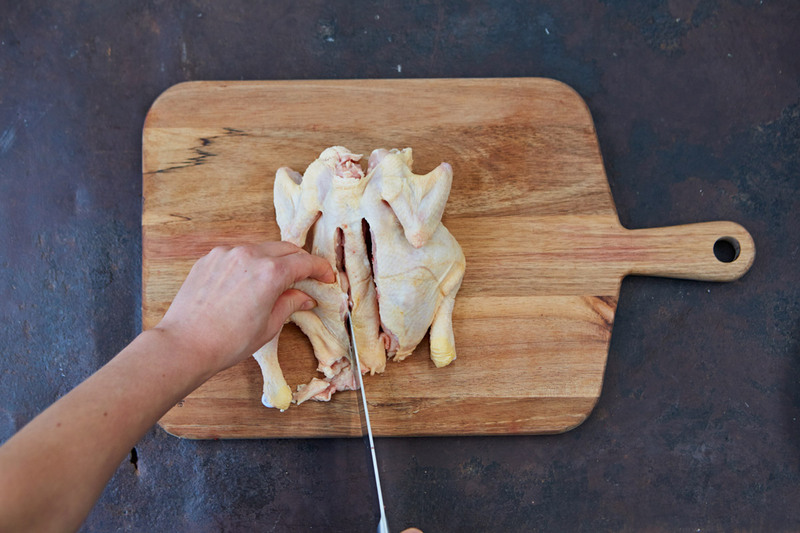 Luckily, you can jazz things up by learning a new technique, such as how to spatchcock chicken – in this feature, our friend the Food Busker shows you how. 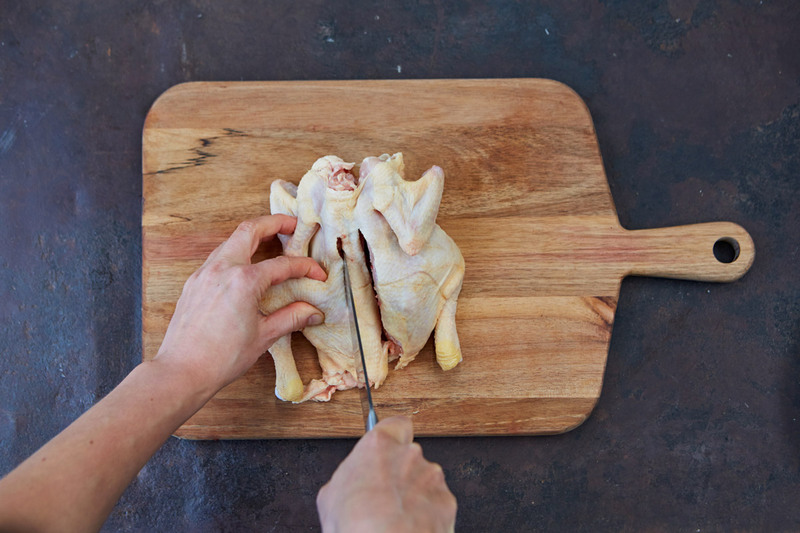 To spatchcock a chicken, or butterfly it, is to remove the backbone, thus allowing it to be completely opened out and flattened. 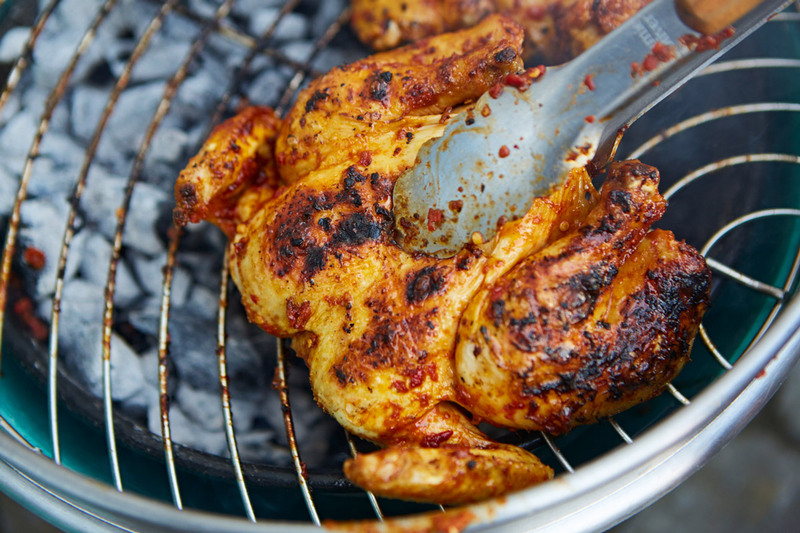 Doing this reduces the cooking time significantly and allows the whole bird to be cooked in different, speedier ways, such as grilling or pan frying. 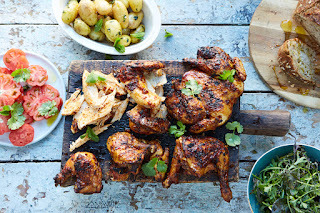 I love to cook poultry this way because of all the wins that are involved: you halve the cooking time but still get to keep the meat on the bone, meaning it retains all that delicious flavour. This foolproof recipe is great for a summer barbecue, but can also be cooked in the oven year-round. 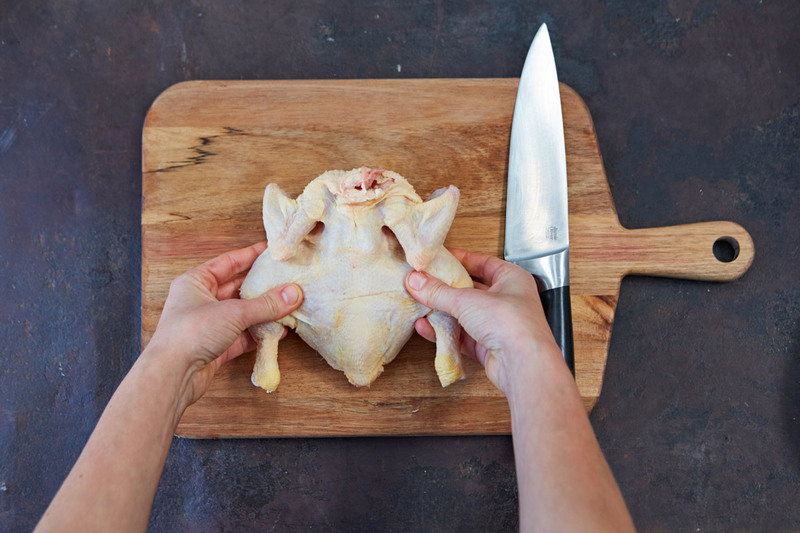 Tip: If you’re uncomfortable using a knife to remove the chicken spines, you can use a pair of large kitchen scissors instead. 1. To make the marinade, char the pepper on the flame of your hob or under the grill until blackened all over. Place in a covered bowl to steam for 10 minutes, then remove the skin and deseed. Peel the garlic and trim the chillies, then add to a food processor with the pepper, lemon zest and juice, oil, paprika and molasses. Blitz until fairly smooth. 2. 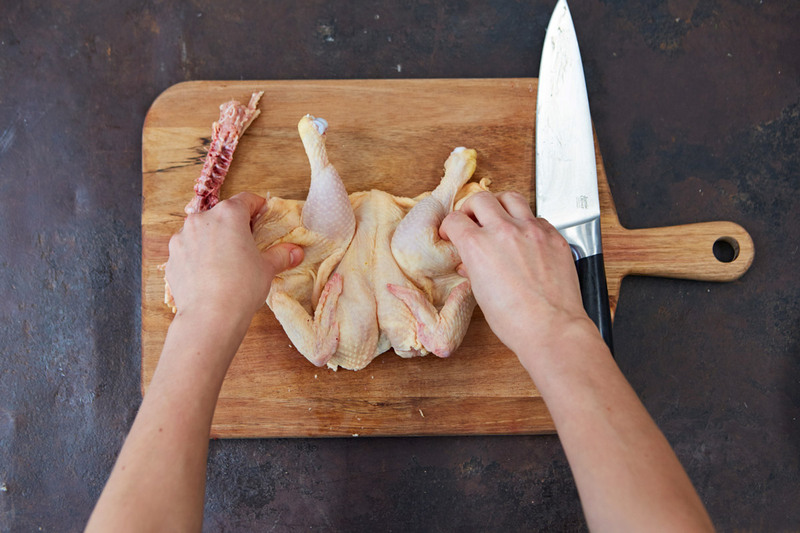 Remove any chicken giblets, then splay open each chicken, breast-side down. Remove any excess fat. 3. 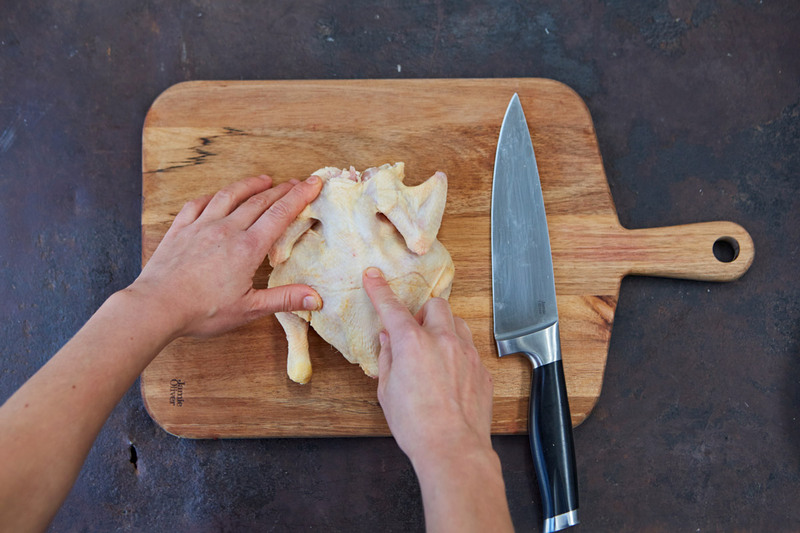 To remove the spines, run a finger along back of each chicken to identify the bone and the soft outer side of the ribcage. 4. Place the tip of a large sharp knife vertically to one side of the spine, insert it and press down firmly. 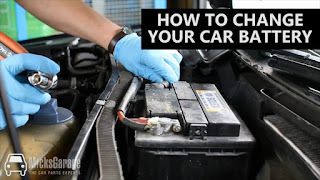 Bring the rest of the knife down along one side of the spine in one movement to cut all the way through, placing the palm of your hand on the back of the blade to exert extra pressure. 5. Turn the birds around and repeat so you have cut all the way down one side of each spine. 6. Repeat the technique on the other side of each spine, then remove the bone – save it for making stock. The birds can now be spread out completely on the board. 7. Rest the heel of the large knife on the chicken wing joint. In one swift movement, cut through the ligament, then remove. Repeat for the other wing and save them for making stock. Repeat with each bird. 8. Pour the marinade sauce over each chicken and leave for at least 2 hours. 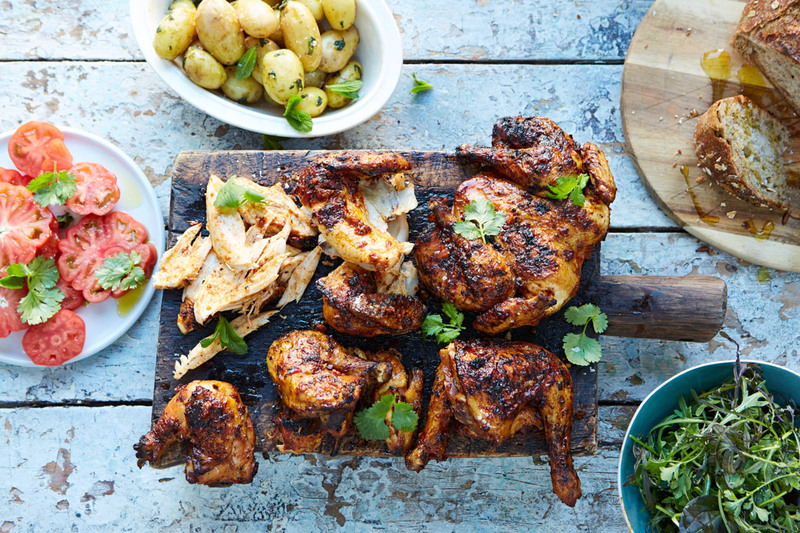 Cook the chicken over indirect heat on the barbecue for 35 to 40 minutes, or until cooked through, or roast in the oven at 190ºC/375ºF/gas 5 for 30 to 35 minutes. Delicious served up alongside rice or couscous. 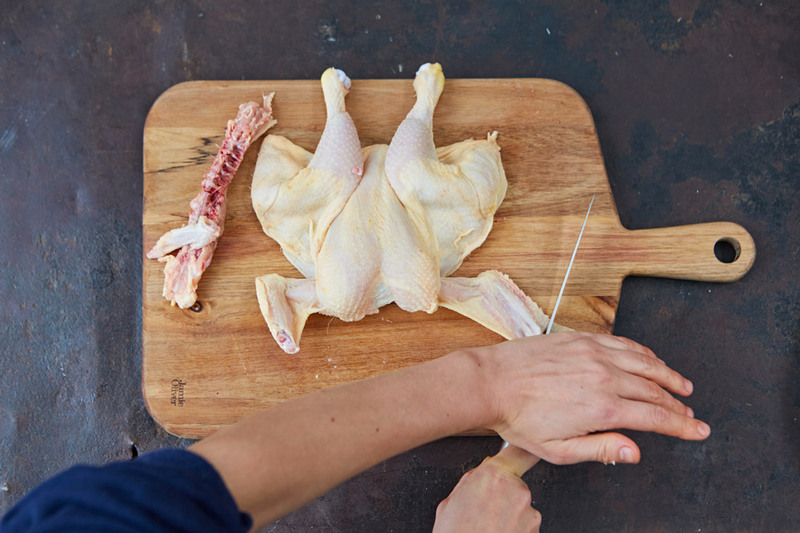 You could also bring your chicken to life by dragging a homemade herb brush over it, or try stuffing some blue cheese or bacon under the skin.